Am I going crazy or has this feature been removed? No one can tell me? Not quite sure what you mean, there's mini-player control in the Notifications bar if that's what you mean? That happens automatically, and the contents will change when songs change. Yes, but it's gone! My Poweramp no longer shows the ticker. It no longer has that option in the settings. When a song changed, I no longer have a notification for that song. In the past, when a song changed, the top part of my Android phone would show me the song that had changed. Now nothing happens. Odd, I don't know where that has gone. It's still there on my device, running the new alpha build. Could you try rolling back to release 582 and see if that does the same? I don't know how to roll back versions? I am just using it from the Play Store. Just download and install an older version from the first post in http://forum.powerampapp.com/index.php?/topic/3189-poweramp-build-584-updated-10-feb-2016/ . The previous version apk files are hidden under a "Spoiler: Show" link to avoid people downloading them by accident. Just download one of the most recent versions onto your device and run it from the device's file explorer app. Yes, it is there in 582 and gone in 584 (currently the latest on the Play Store). If it's in the alpha build, hopefully it will come back in the next version? I very much liked that feature. Now updated to build 585 (from the Play Store) but this feature is still missing. As a paid customer, is there any way to get support on why this is so? Unfortunately, while it might sound minor, it's a feature I particularly liked and will probably find another player that does it if this one no longer does. Just block updates for the time being and stay with build 582 - unless you are running an Android 6 (marshmallow) ROM and specifically need builds 584 or 585 for some reason. As you say, I suppose it's not really a critical issue from a developer's time point of view. 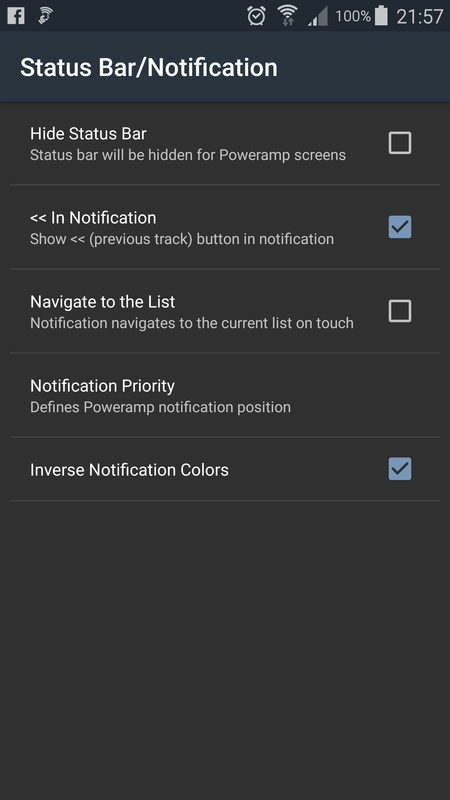 Go to android Settings, Apps, Poweramp, and turn on "Show notification". 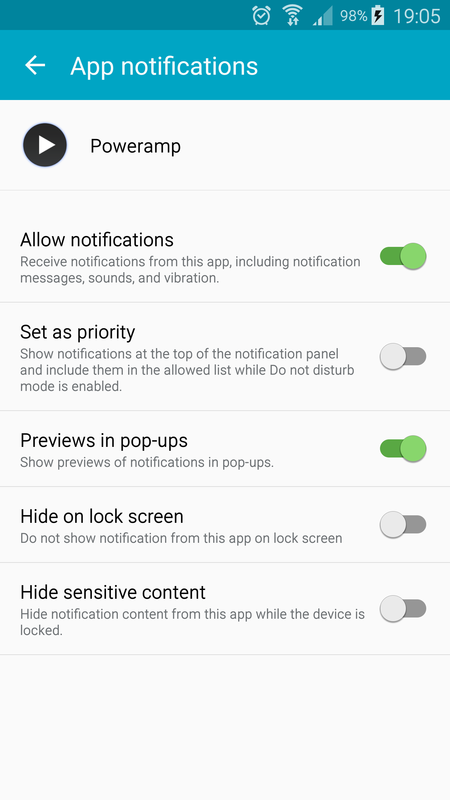 The notification settings in Android seem to be on. See attached. I had the same problem, and go crazy, until i found this, and solved for me. Thanks. It's annoying. It seems it works for other people, just not me.